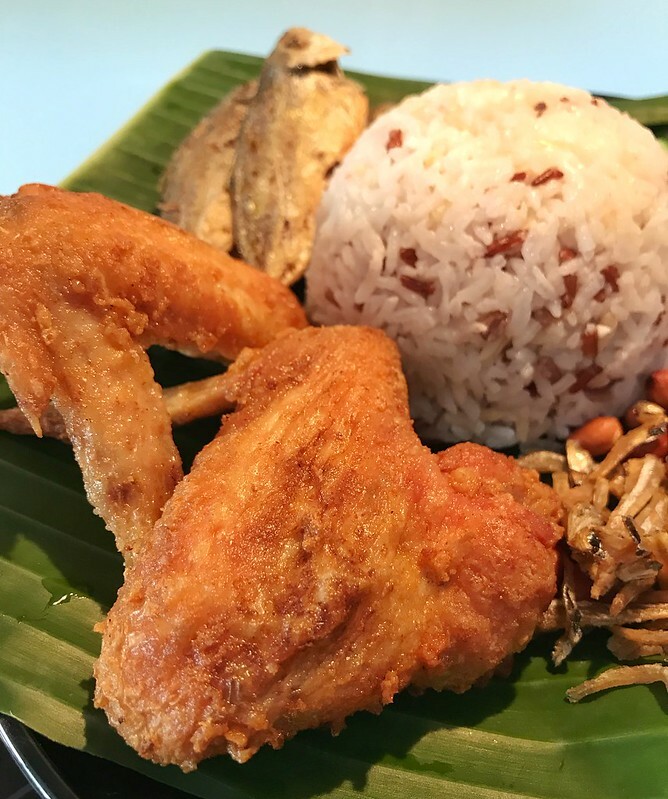 Nasi Lemak is a Malay dish. When I first came to Singapore, I tried it. But didn’t have any deep impressions on it. The specialty of it lies in rice, which is cooked with coconut milk. But when I had it before, rice was cold, so I couldn’t taste the fragrance of coconut milk. The other day, I tried cooking rice with coconut milk, the rice turned out very nice. So I bought pandan leaves, lemon grass, sambal chili sauce and decided to cook my first nasi lemak. Put all the ingredients above into rice cooker and press the cooking bottom. Trust me your kitchen will smell so so good. For side dish, I chose to fry yellow strip fish (kuning) and chicken wings. Also served with peanuts, anchovies, egg and cucumber. Place Yellow strip fish in a bowl, sprinkle salt and white pepper. Put chicken wings in a big bowl, add in 1/2 tsp salt, 1/2 tsp whit pepper, 1/2 tsp chili powder, 1/2 tsp ground ginger, 1 tablespoon corn starch, 1 tablespoon rice flour and 50 ml coconut milk. Mix well and marinate for a little while. 1. Heat a lot oil in the frying pan or pot. Add in dried anchovies, fry till golden brown. Dish them out. Fry peanuts till aromatic and brownish. 2. Fry yellow strip fish with low heat. Dry the fish before frying. Be careful of the hot oil. Frying fish till bone is also crispy. (My husband loves crispy fried yellow strip fish). 3. Last fry chicken wings. Also use low heat. Fry chicken till golden brown. Spread a banana leaf over the plate. Place rice in the middle. boiled (or fried ) egg, cucumber slices and don’t forget the sambal chili sauce. Serve hot. That’s also very important. Reblogged this on Singapore Maths Tuition.